The Florida Keys National Marine Sanctuary underwater pumpkin carving contest is an innovative take on a popular Halloween activity for kids and adults alike. Rather than taking a knife and carving a pumpkin on the kitchen table, scuba diver entrants to the competition can take their pumpkin, dive down into the warm waters of the Florida Keys, and exercise some artistic license using a small knife. Ordinarily it would be difficult to relate scuba diving to the political machinations currently going on in the US, but two of the forty-two contest entrants found inspiration in the recent debates between Barack Obama and his Republican rival, Mitt Romney. One contestant carved an image of Mitt Romney into her pumpkin because it is the story of the moment and she felt that everyone was talking about it. “I decided to carve Mitt Romney because of the debates and all the other fervour surrounding the elections,” she said. Poor Obama couldn’t be left out, so another contestant carved a likeness of him. So it remains to be seen whether either contestant “wins” in the underwater pumpkin carving contest, or indeed in the forthcoming presidential election. But no doubt the two presidential candidates have seen the funny side of the story—poking fun at each other seems to be a common theme in the debates so far, with neither man shy about having a sly dig at his opponent when the opportunity arises. 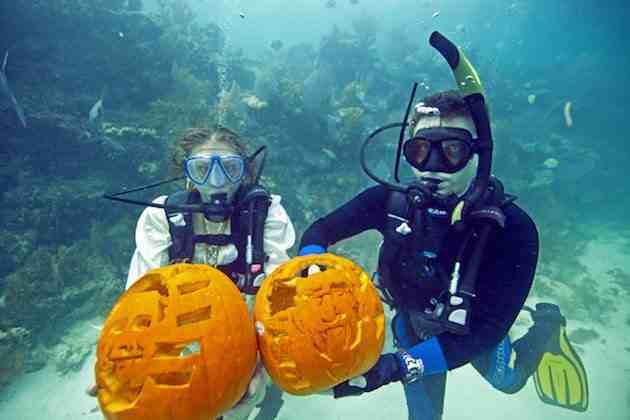 So apart from carving pumpkins underwater, are there any other exciting scuba diving opportunities in the Florida Keys? Of course there are! Keen divers can come to the beautiful Florida Keys and explore the third largest coral barrier reef in the world. The reef is over two hundred miles long, starting at Miami and ending 70 miles west of Key Largo. Much of the reef has been designated as a conservation area in order to protect the delicate coral habitat, but there are still plenty of excellent dive sites and water visibility is exceptional, which is why the area draws thousands of keen scuba diving enthusiasts every year. And if you have never tried scuba diving before, the Florida Keys is a great place to earn your open water certification! This entry was posted in Featured, Florida, Scuba Diving, Travel, United States, Water Sports and tagged Florida, Pumpkin Carving, Scuba Diving. Bookmark the permalink.